South Carolina has recently joined its next-door neighbor, North Carolina, in undertaking innovative approaches to administering National Pollutant Discharge Elimination System (NPDES) water quality regulations. NPDES regulations help to achieve national water quality goals established by the Clean Water Act. The NPDES program is administered by regulatory agencies at the state level, with oversight from the Environmental Protection Agency (EPA). Regulators issue permits to wastewater discharging facilities, prescribe pollution abatement technology and control strategies, and administer a monitoring, reporting and inspection regime. For facilities operating in the Upper Saluda River basin in the upstate region of South Carolina, wastewater discharges are now managed at the basin scale, rather than at the individual facility level. In addition, the regulated facilities themselves have a greater say in how water quality goals will be achieved. Although this approach is new for South Carolina, collaborative strategies focused on hydrologic areas have been in use in North Carolina for many years. Excessive levels of nutrients, including phosphorus and nitrogen, can be found in surface waters in both urban and rural areas, and pose serious threats to water quality. Historically, wastewater treatment plants (WWTPs) in the Upper Saluda basin could legally discharge unlimited amounts of phosphorus effluent into receiving waters. By the late 1990s, concern over nutrient contamination in the state’s lakes and rivers was growing. 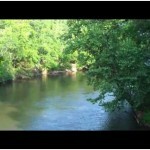 By 2009, the condition of the Saluda River itself was receiving national attention. In response, the state’s water quality regulator, the South Carolina Department of Health and Environmental Control (SCDHEC), introduced a basin-wide phosphorus limit for the Upper Saluda River in 2011. Opting for a basin-wide limit on phosphorus, rather than facility-based discharge limits, is a departure from standard water quality regulatory practice in South Carolina. Traditionally, pollutant limits would be imposed on individual facilities and an effluent control strategy prescribed for each. However, when water quality regulations are organized at the basin or watershed level, decision-making authority is devolved. Regulated facilities develop collective strategies for complying with water quality standards. Under the basin-wide limit in the Upper Saluda, for example, WWTPs which previously operated independently are now brought together by a shared responsibility for reducing phosphorus contamination in the river. The facilities devised their own strategy – a “load sharing” arrangement – to meet this goal. Under this arrangement, individual facility discharges vary based on abatement capacities, but in the aggregate, the phosphorus load to the basin is kept within the limit. WWTPs in the Upper Saluda prefer the new approach. Decisions over control technologies and strategies are made by plant operators who know their facilities best. SCDHEC is also supportive, since shared decision-making leads to greater buy-in to the overall effort. In addition, some administrative and monitoring burdens are eased. Of greatest importance, however, will be improvements to water quality in the Upper Saluda basin. Expectations are high in this regard. And they should be, especially when South Carolina looks to the example set by its neighbor to the north. Some of the best known examples in the country of basin-level collaboration for water quality administration are found in North Carolina. Starting in the 1980s, nitrogen and phosphorus levels became a concern for water quality in North Carolina’s coastal plain. More recently, excessive nutrient levels have emerged in lakes and stream in the central part of the state. In each of these cases, wastewater dischargers have organized and have taken action to mitigate water quality threats with assistance from the North Carolina Department of Environment and Natural Resources (NCDENR). The Neuse River Compliance Association (NRCA) is a group of wastewater dischargers operating in the Neuse River in the coastal Plain of North Carolina. The NRCA, as a collective, holds a watershed-based permit for nitrogen discharge. Members of the NRCA share permit responsibilities, as well as information on operations and technology. They also pool their pollutant reduction capabilities, trade pollution credits, and even assess fines on themselves when the need arises. The Tar-Pamlico Basin Association is a consortium of dischargers operating in the Tar-Pamlico River basin, one of the largest estuarine systems in the country. Like the NRCA, the Tar-Pamlico Basin Association also addresses basin-wide nutrient pollution through collaborative means. The Association funded advanced computer modeling of the basin’s hydrodynamics and pollutant loading patterns for use in determining nutrient limits. It also participates in a pollution credit trading program that includes “non-point” discharge sources, such as farms. In the Jordan Lake watershed, located in the central part of the state, where the rapidly developing Triangle and Triad areas are found, a comprehensive phosphorus and nitrogen control strategy was recently implemented. As in the basins noted above, the Jordan Lake watershed strategy includes a group compliance arrangement for point-source dischargers. The strategy also includes the possibility of pollution credit trading, like in the Neuse and Tar-Pamlico basins. In these cases, regulated dischargers and regulatory agencies worked together to implement basin or watershed approaches. But at this scale, water quality decisions affect the interests of other stakeholders – environmental advocacy groups, citizens’ groups and others. By representing local residents’ concerns or focusing on environmental quality and sustainability, these groups play a vital role in the process. The Upper Saluda Basin case is a prime example. Stakeholder groups such as Upstate Forever, the Saluda-Reedy Watershed Coalition and People for Lake Greenwood contributed analyses and information, made suggestions and recommendations and helped to maintain attention on water quality issues in the region. Innovative approaches to water quality administration, like those being implemented in the Carolinas, are indicative of a wider trend in natural resource management. Across the county, top-down, command-oriented regimes are being replaced. More inclusive approaches, which operate at ecologically sensitive scales and enable adaptation to local conditions, are primed to achieve environmental results in addition to new administrative efficiencies.